You are here: Cyborg5 Home > CY's Eye on Life > Merry Christmas to All! I’m taking time out from talking about all of my medical problems to wish everyone a Merry Christmas and to share with them my computer-generated Christmas card. This card was designed, computer modeled and computer rendered by me. The model contains over 120,000 objects. There are 139 light bulbs each of which contributes illumination to the scene. There are 249 branches consisting of 66,603 needles. There are 62 loops of garland created from 28,816 pieces of tinsel. 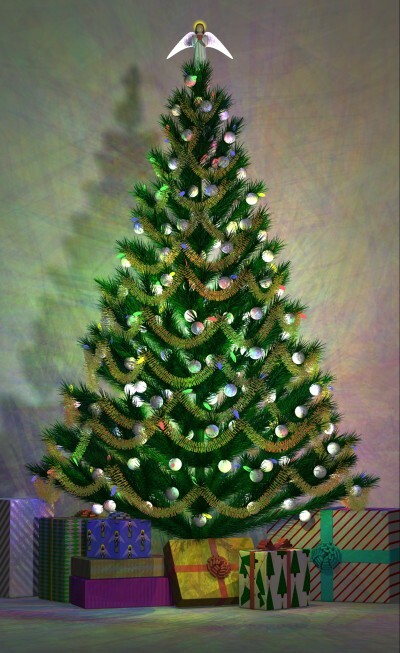 There are 98 sphere ornaments. The angel and packages were adapted from previous card designs. It took about 30 hours to design, test render and re-design. The final image was rendered at 1425 x 2325 (300 dpi) resolution. It took 21 hours 57 to render on a 3.2 ghz Pentium 4HT computer running Windows XP Home Edition. ©2006 Chris Young, All rights reserved.